Now we know why Yahoo chose not to appoint interim CEO Ross Levinsohn as its full-time leader: the company got Marissa Mayer instead. Mayer, the head of the Google Search group and the 20th employee at the search company, will start immediately at Yahoo. Google and Yahoo started as similar companies. Both were search giants, but at different points in their respective histories they diverged. The subsequent tale of the tape shows that Google's direction -- guided by strong leaders -- was the more successful path. Here's what we can expect Mayer will bring to Yahoo. The engineering culture that Mayer helped build at Google. Google has historically been run with an engineering mindset. The best Google services are fast, functional, and continually tested and improved as time goes on. Mayer herself was proud of talking about how even a tiny change in the position of an item on the Google Search page would be tested and evaluated over and over again. The company's main products were driven by data, not art. Over time this has changed (see the Nexus Q, for example), but for its main products, Google is still driven by the numbers. Mayer will likely bring this same rigor to Yahoo's products, in particular, the home page, Yahoo's portal to the Web. Her expertise in relentlessly tweaking products to extract maximum utility out of them could also extend to Yahoo Mail, still one of the largest e-mail providers. Yahoo applies a lot of data tricks in delivering its home page to its vast audience, but the key will be extracting more dollar value from the billions of Yahoo pages viewed. Mayer has not run an entire company, though, so it may be a challenge for her to adjust the culture of Yahoo. And it is the organizational culture at Yahoo that needs to most help. "Yahoo takes too long to make decisions," says Salim Ismael, who ran the Brickhouse project at Yahoo -- a group set up outside the standard reporting structure at the company so it could innovate more quickly. "On the Internet you need speed, and you need to take risk. 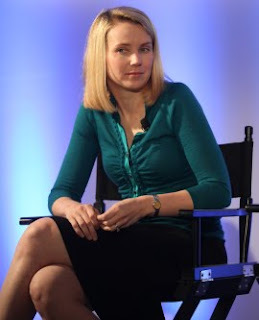 Yahoo accidentally adopted a matrix organization structure that's antithetical to both," he says. Yahoo could also use some of Google's ruthlessness in killing projects. The company gleefully reported on its 2012 spring cleaning project (which, for all we know, is ongoing). In a large, interlinked structure, which Yahoo apparently has, it's difficult to make the right decisions about killing products. Google, though, maintains an optimism about its direction even as it chops down its underperformers. That's due, in part, to its capability to learn from its mistakes and not punish people involved in them. Even though Google killed social experiments like Buzz and Wave, it forged ahead with Google+. Even though its structured knowledge product Knol died, Google Search inherited a lot from the project. And this points to another big strength of Google: the company is very good at working on long-term visions. Social has become key to the company's growth despite early failures. Google is also becoming a media company, throwing big money into hardware initiatives like Google TV and the Nexus Q media streamer, products that, in their initial incarnations, are not going to be remembered as successes. Google is also pushing to take a few market share points from Apple and Amazon in the media sales market. It's much easier for a company that has resources like Google to play the long game, but a new CEO with Mayer's background and energy should be able to divert some funds to play some long-range bets and recruit some top talent back into the Yahoo fold. Finally, there's the engineering-friendly culture of experimentation, or to put it in more shareholder-friendly terms, an R&D focus. Google is doing original research in areas that appear to be orthogonal to its mission -- self-driving cars, augmented-reality eyeglasses, and even energy. But these projects can pay off in numerous ways and their value can (but not always) feed back to the mainline business. On the other hand, Yahoo doesn't have the resources today to focus much beyond fixing what is broken at the company. Can a media company be successfully run as an engineering company? Google, it needs to be said, actually is a media operation. It makes its money selling media advertising, and gathers 72 hours a minute of video on YouTube. Can the same discipline work at Yahoo? There's probably no one better to give it a shot than Marissa Mayer.